Thanks to Game-Panel and EA Games, the 2004 Golden Spanner Mod of the Year Awards now have a few sponsors on board. Hence the winning mod teams may very well be walking away with more than just the glory and a pretty GIF image to plaster all over their webpage. Keep checking back for more news. Oh and if your company wants to support the great mod makers out there whilst been shamelessly promoted on this site, get intouch via the image below! Want to give your mod the best chance of winning? Well then encourage your mods fan to come here and vote for it! To help you out we've put together a few promotional images your free to use and edit at will. 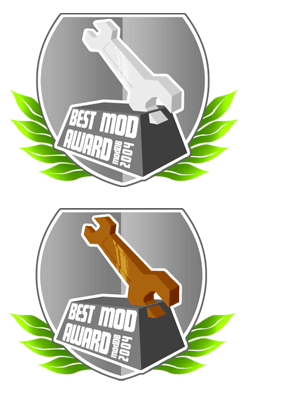 Good luck, get voting and may the best MODS win! LionHead Studios!? Woot!!! That means that we can expect some wacky-cool prizes, like a model land-shark gun! :O!!!! armed and dangerous!!! XD! Good job on the sponsorship. Also, LionHead Studios will be sponsoring. I been trying to tell scotty for ages! I guess $$$ will force EA to change, because A LOT users buy **PC** games that has modability because.. HEE!!.. you love mods and new more better maps!. Looks "Star Wars Battlefield", the default maps are CRAP, designed for console limits, so on PC are absurd, withouth a SDK its imposible to generate good maps that fix that problem. So less people will buy this game, and will buy other guys game. If EA not get that money, other company will grown with that money. EA makes bad games, it really scares me that they are taking interest in the mod community, seeing as their main business strategy is to buy people and companies (or force them out of business) and use the name to sell a really crappy product, like the James Bond games. They also have a human rights record almost as bad as Wal-Mart, so I would advise modders NOT to accept any job offers from Electronic Arts. If you do you may become very tired and very poor.